Your audience acquisition strategy is just begging to be improved with data-driven insights. If you’re looking to attract a new or expanded audience, this article is for you. And, if you’ve been doing the same old thing (ahem, email), expecting to get different results with no success, then this article is especially for you. It outlines 10 data sources you can tap into to gain new understanding of your audience and their preferences, along with the trends, channels, timing, and more that will improve your audience acquisition strategy. 1. Attendee surveys: It’s time to look beyond catering. Attendee surveys are probably the one bit of data that most event planners and strategists pay attention to on a regular basis. But are you mining the data and insights that can best shape your audience acquisition plan? If you’re not looking for trends in content and messaging preferences, then you’re missing crucial input that can help take your audience acquisition strategy to the next level. Even simple questions like, “What content are/were you most looking forward to at XYZ event?” will help focus your messaging when reaching out to various audience types to register for your event. In an ideal world, you’ll field a pre-event survey as well as a post-event survey. This means you’ll not only have fresh, actionable input from prospective attendees, but you’ll also be able to gauge how well you delivered on those audience desires after the event. You can further fine-tune your plan by using the survey to collect audience information and media preferences. 2. Attendee polls: Sometimes the best way to find out what people care about is to ask them. 3. Registration data: It’s more than just numbers. What you can gather from registration data will depend on what registration platform you use and how it is set up. 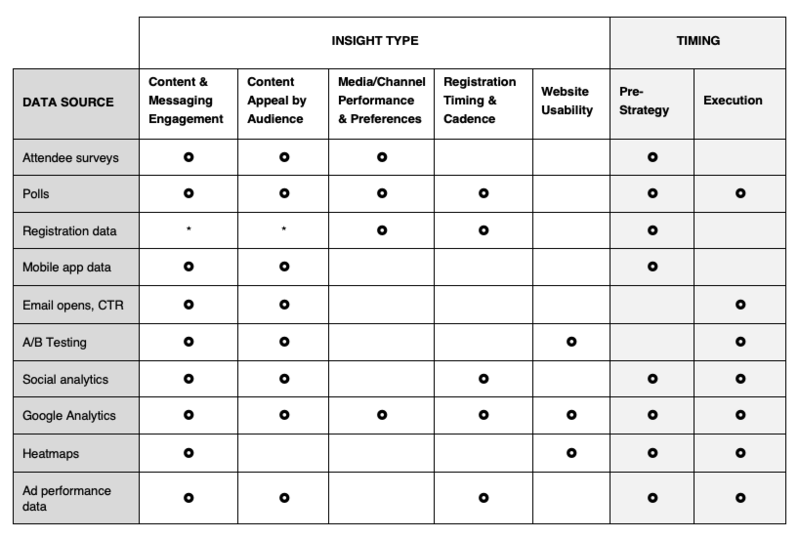 There’s no doubt that multichannel attribution (which tracks all the channels that might influence conversion to registration) is challenging at best, and most events use last-click attribution for measurement. This means the last channel a prospect visited before converting gets 100% of the attribution (provided it’s being tracked). That might seem “unfair” (especially say, if an inspirational video on social media is what compelled a user to attend but they didn’t click from the post to register), but it also tells us something valuable about which channels we might want to invest more of our budget on. Past registration data can also provide useful information about when prospects are most likely to register. If, year after year, we’ve seen that most people tend register in the last six weeks leading up to the event, we can focus our efforts and budget during that timeframe. 4. Mobile app data: More is more. What you can get out of your mobile app will depend greatly on what you put into it. 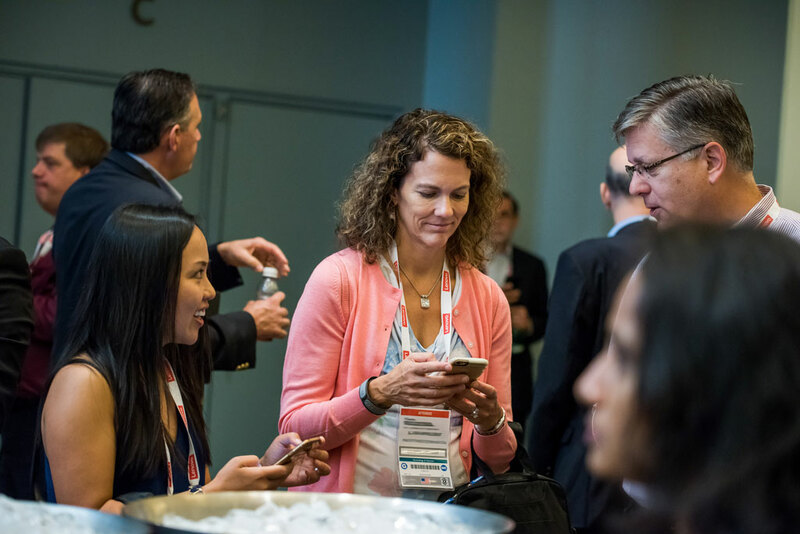 If the mobile app is not very engaging and attendees are using it as merely a “schedule in their pocket/purse” then you’re not likely to get much useful information out of it. On the other hand, if you’re using your mobile app to encourage social interaction, crowdsource information, drive live Q&A and polling, or collect surveys and evaluation input, then there’s a wealth of information you can draw from before you ever build your audience acquisition strategy. Mine conversations to find topics that matter to your attendees. Discover what gets them excited, confused, inspired, or scared by reading through the Q&As, and use that content to build compelling messaging. Your mobile app is yet another place where you can draw a larger pool of data from which to draw insights related to content, messaging and audience. 5. Email opens and click-through rate (CTR): Learn what resonates. While registration and mobile app data is something you’ll want to review before you ever begin your audience acquisition strategy, you’ll want to continually track your email opens and click-through rates during your campaign execution. By tracking email opens, you can see which messages are resonating and moving prospects to take action—e.g., to open the email—and which are not. You may find that certain audience segments respond better to certain messages. For example, a technical audience is more likely to open an email offering free certification courses in the subject line than an executive-level audience would be. Be sure to overlay your open rates with your audience segments to find actionable insights. Use CTRs in a similar fashion. If you see that a certain email is driving a much higher click-through rate, compare it to those that are not performing as well to determine the differences. It could be that the high-performing email has more images or reveals a secret or provides a special offer. Once you know what is sparking your readers curiosity, you can optimize your future emails accordingly. 6. A/B testing: May the best content win! Use A/B testing to further refine your content and messaging. Again, this sort of data is typically used during the execution phase of your audience acquisition effort, so you can optimize your efforts. There are many things you can A/B test, including your emails, online ads, website, registration forms. What you should test depends on what your goals are. For example, you may want to test two different subject lines for an email because you’re not sure which message will work best. Or, you may find people are abandoning registration midway through the process and suspect the form is too lengthy, so you want to try a streamlined form. Whatever you decide to test, it’s important to have clear goals in mind first, and then test using controlled variables. 7. Social analytics: Best of both worlds. Most social analytics platforms provide information that will be useful to you before and during your audience acquisition plan implementation. Before you start, you can understand the general sentiment and engagement of your prospective audience (based on the previous year’s data). You can also gather useful demographic information about those people who engaged with your event last year. Together, this information helps to paint a richer picture of your target audience, so you can better connect with them through content. Leading up to and during the event, you can track and engage with influencers and market to your audience in real time. Not only can you learn what messages appeal to your target audiences, you can also see the impact your efforts are having. 8. Google Analytics: A wealth of digital data. All of this information can help you determine what content is most valuable to your audience and how you can best present that on your event website. It can also help you understand what other media channels prospective attendees are using, and how many touchpoints you might need to drive a conversion. 9. Heatmaps: The hotter the better! Heatmaps are another great tool for optimizing your event website as they show exactly where visitors are spending their time on the site…not just page by page, but pixel by pixel. If you implement heatmap software (which is as simple as inserting a line of code), you can discover the digital body language of your website’s visitors. With tools like Clicktale and Hotjar you can gain insight from every mouse move, hover, scroll, tap and pinch. Find out how, and if, users are scrolling to see content on your pages. Learn if they’re even seeing your call to action. Discover what content and images are attracting attention. With this level of insight, you can turn your event website into a magic weapon. 10. Ad performance data: It’s about content and timing. Reviewing your ad performance data from last year’s event can give you some clues as to what type of content and messaging might appeal to what audience segments, and when in the time horizon leading up to your event you should run your ads. Tracking and measuring ad performance during campaign execution will enable you to optimize your content and timing to better meet the needs of your audience. *Dependent on how reporting is tracked. If universal tracking is available, it may also be possible to track some content and messaging with registration data. For example, if we find that a certain social post is driving a disproportionately high number of registrations, it may be because of the content or messaging. You may not have all of these discovery and data sources for every event, but if you do, now you know how you can put that data to work for you. Still not quite sure how to make sense of it all or don’t have the time? InVision can help. Read our press release or contact us to learn all about our comprehensive audience acquisition offering. This entry was posted in Audience Acquisition and tagged A/B testing, analytics, Attendees, audience acquisition, click through rate, crowdsource, CTR, data, Engagement, event, Google, heatmaps, mobile app, polls, registration, social, social media, strategy, surveys. Bookmark the permalink.